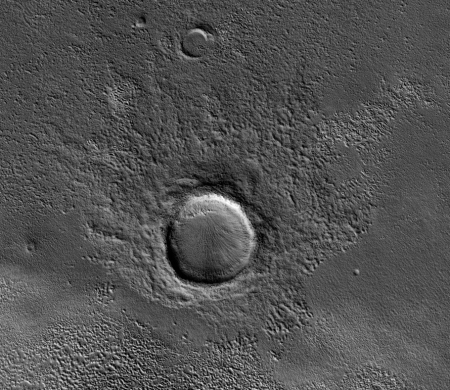 In many ways it resembles the craters I posted yesterday, with a splashed look and a crater floor with features that favor the north. Why that divot exists in the northern half of the floor is to me a mystery. 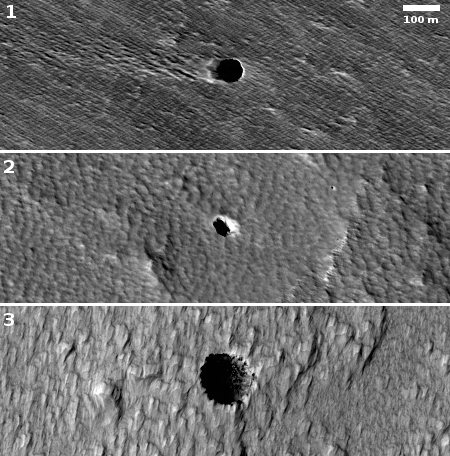 The crater floor looks like a sinkhole to me, with material slowly leaking downward at that divot to cause this surface depression. Yet the rim screams impact. And yet, why the double rim? Was this caused by ripples in wet mud when the bolide hit? 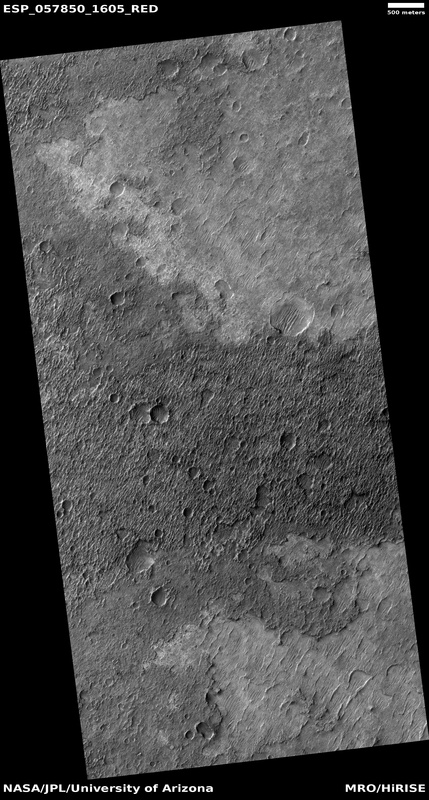 The crater itself is all by itself deep in those northern plains. 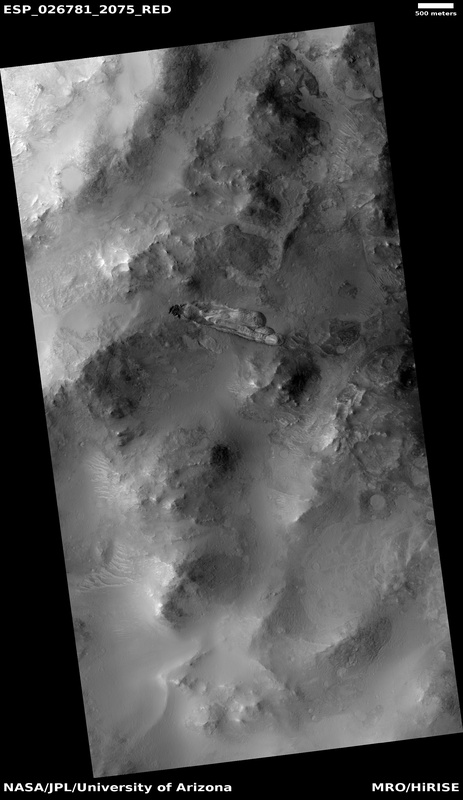 You can see its location as the tiny white rectangle slightly to the left of the center in the overview image to the right. 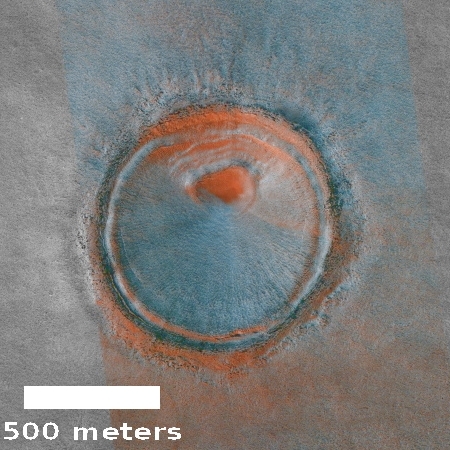 The giant Martian volcanoes can be seen at the image’s right edge, almost a quarter of a planet away. 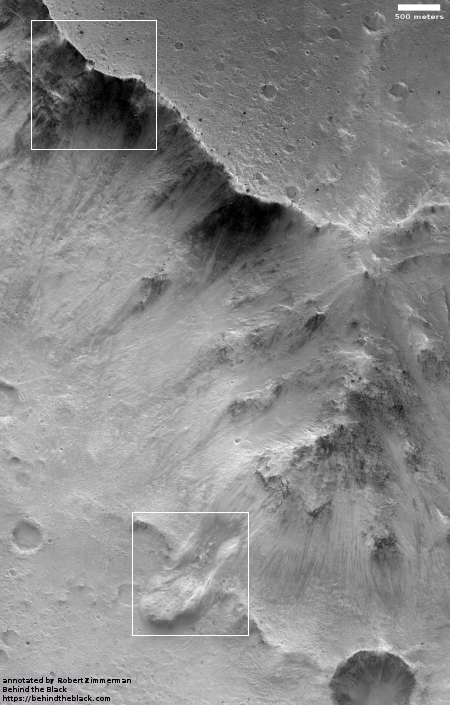 This is at a very low elevation on Mars, almost as deep as Hellas Basin. For some fun context, this location is very close to where Viking 2 landed in 1976. 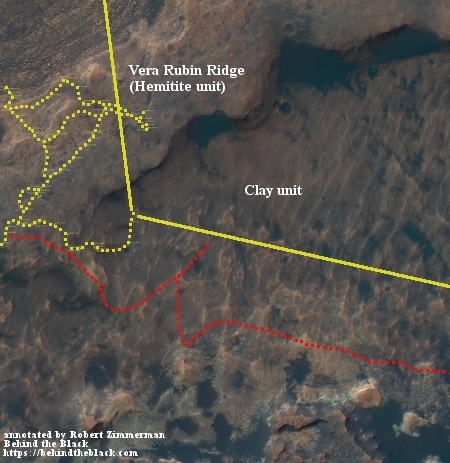 The Mars 2020 rover meanwhile will land at this overview image’s left edge, on the western shore of the oval cut into southern highlands at about the same latitude as Olympus Mons, the largest volcano on the right. 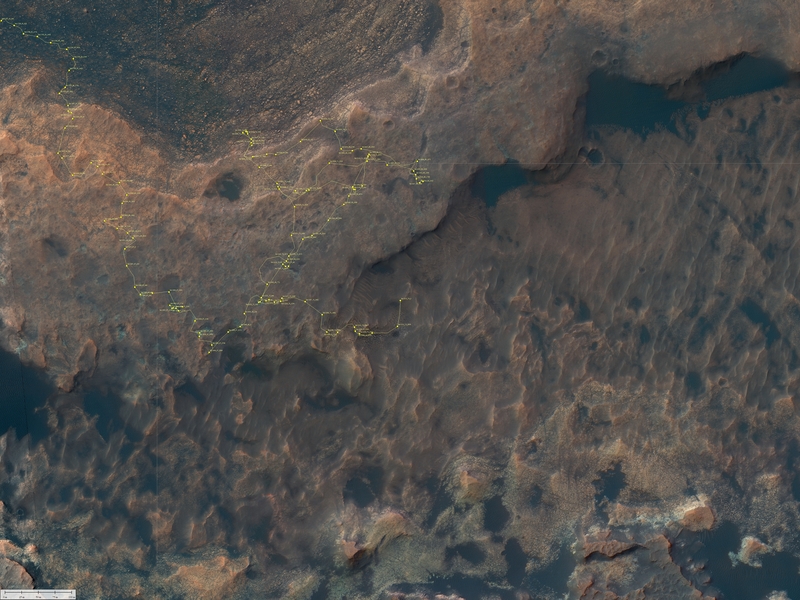 And InSight and Curiosity sit almost due south, with Curiosity in the yellow in the transition from green to orange, and InSight to the north in the green. 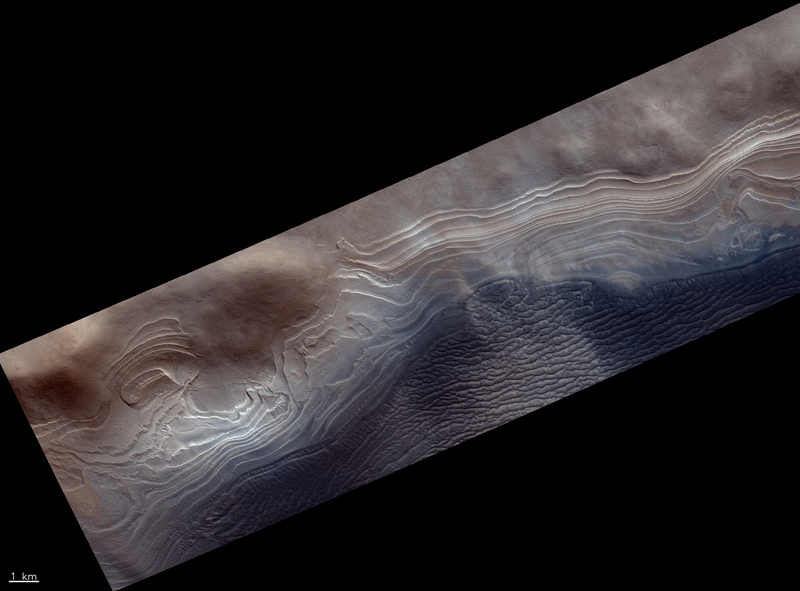 Each month the Mars Reconnaissance Orbiter (MRO) science team highlights with captions about four out of the 300-500 new images released that month. Of the four captioned images in February, the first was entitled “Almost Like Water,” and focused on the waterlike nature of the lava flow. 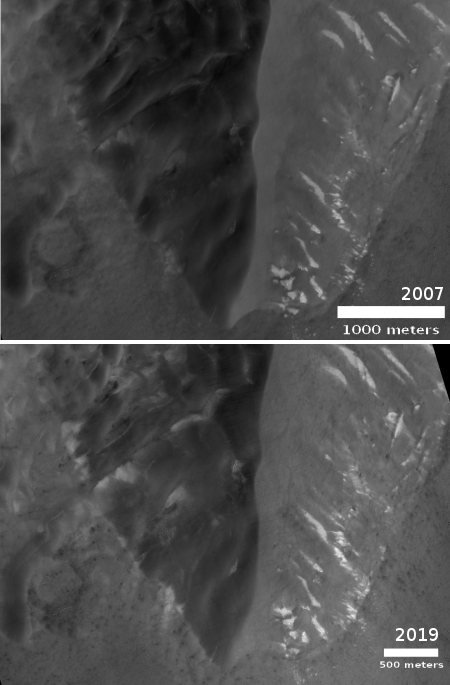 The image on the right is a cropped and annotated section of that featured photograph, with the yellow arrows indicating the flow directions. 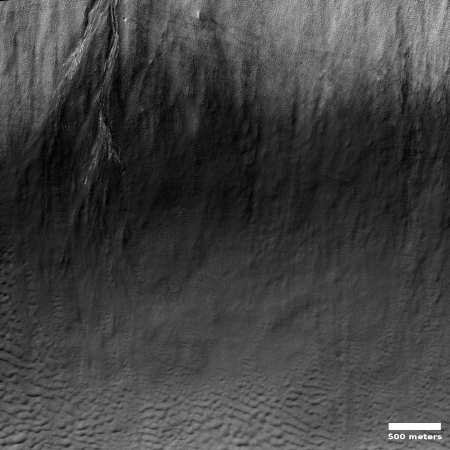 The lava appears to have flowed smoothly around obstructions, almost like water, forming streamlined islands. 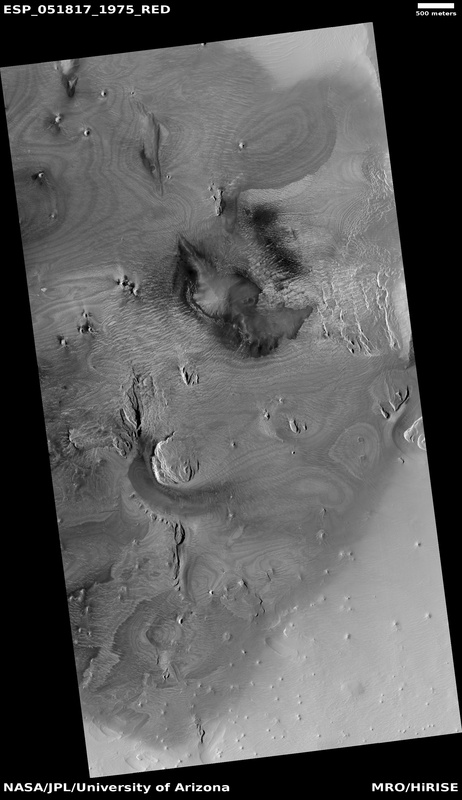 In the southern part of this image, a branch of the flow diverts around a small crater, and eventually rejoins the main part of the flow. 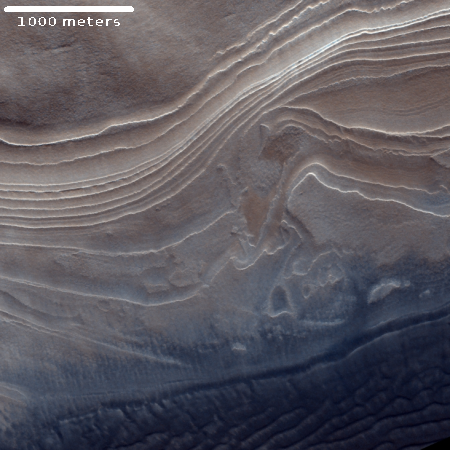 [Visible in the full photograph] Irregular-shaped ring structures appear on the northern end and are related to the volcanic activity that formed the flows. 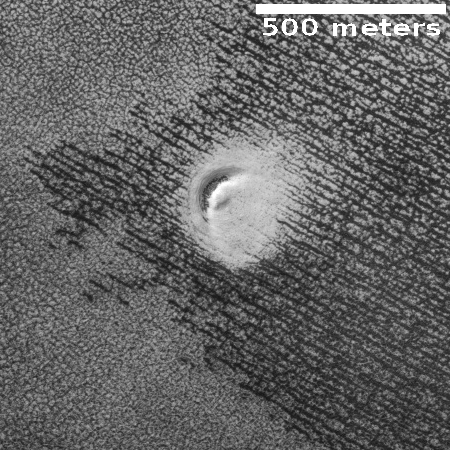 You can see an example of one of those islands near the top of the above image. 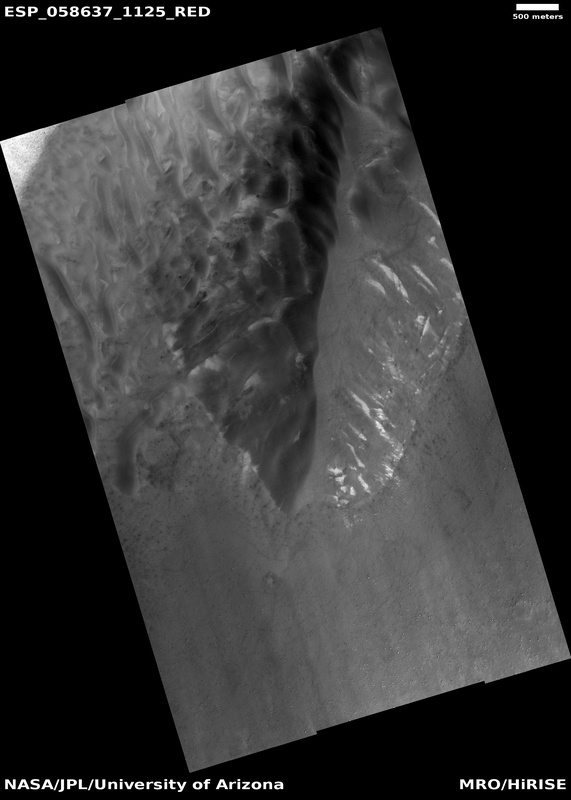 This is hardly the only MRO image showing such flows. In fact, the February image release included a bunch, some of the more intriguing of which I highlight below. These lava flows are seen in many different places on Mars, in a wide variety of geological settings, facts that suggest that volcanic activity was once very widespread and ubiquitous on Mars. 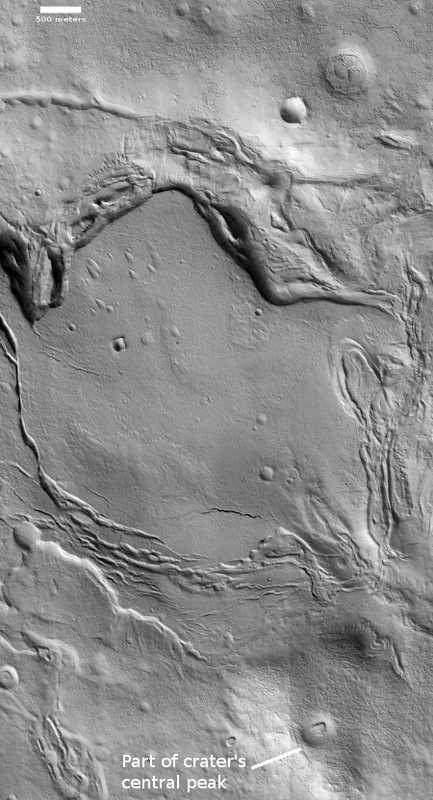 Today’s cool image focuses in on a Mars Reconnaissance Orbiter (MRO) uncaptioned photograph taken of the valley floor of Reull Vallis, a meandering canyon that drains into Hellas Basin, the bottom of Mars. The image on the right is not that photograph. Instead, it is an overview of the area surrounding it. 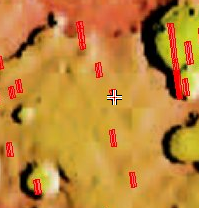 The image location is indicated by the black cross, dead center within the floor of Reull Vallis itself. 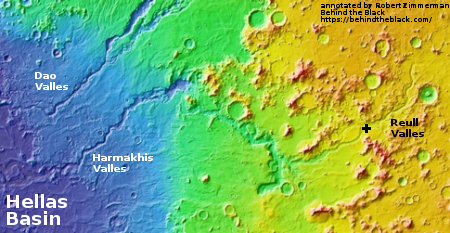 This valley, as well as Dao and Niger to the northwest but lower in elevation are all thought to have been formed from flowing water, all of which apparently drained from the east and to the west into Hellas Basin. This last detail is very important and bears repeating before looking at today’s subject image. 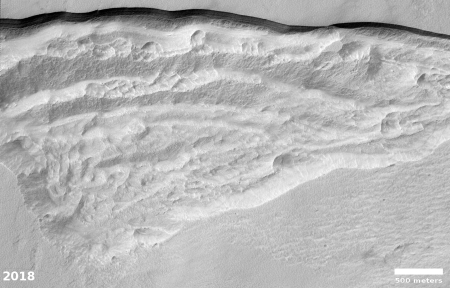 The river that formed Reull Vallis flowed from the east to the west. Now for that picture. 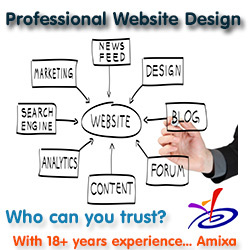 Cool image time! 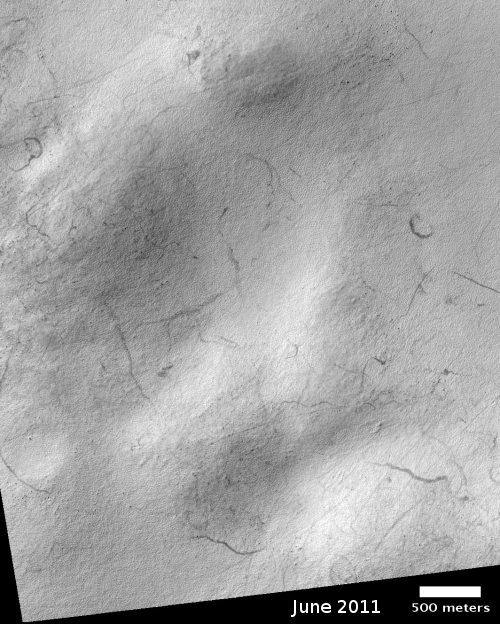 In reviewing the images in the December image release from the high resolution camera on Mars Reconnaissance Orbiter (MRO, I came across the image to the right, cropped, rotated and reduced to post here, showing the western half of the central pit of Asimov Crater. (Click on the link for the entire photograph.) The eastern half can be seen here. 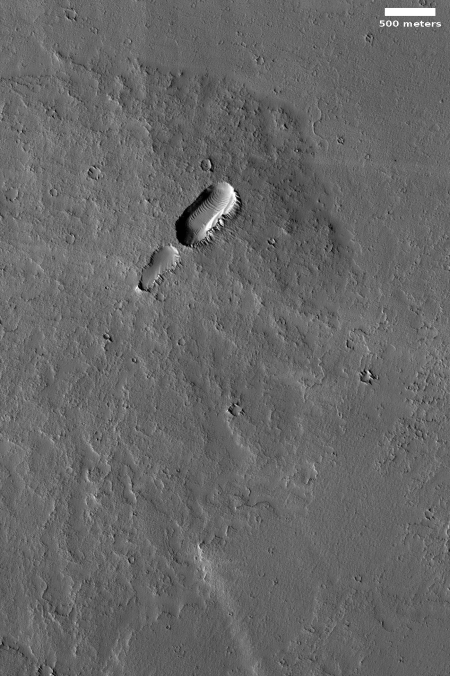 It is unusual to see central pits in craters. One instead expects to see central peaks. The pit itself is intriguing because of its sinkhole appearance. 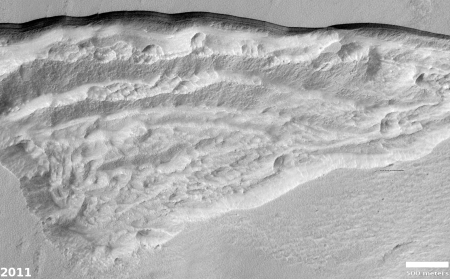 In both the northwest and southwest corners you can clearly see drainages flowing down into the pit, including recent faint darkened streaks indicative of past seep avalanches. The same can been seen for the pit’s eastern half. 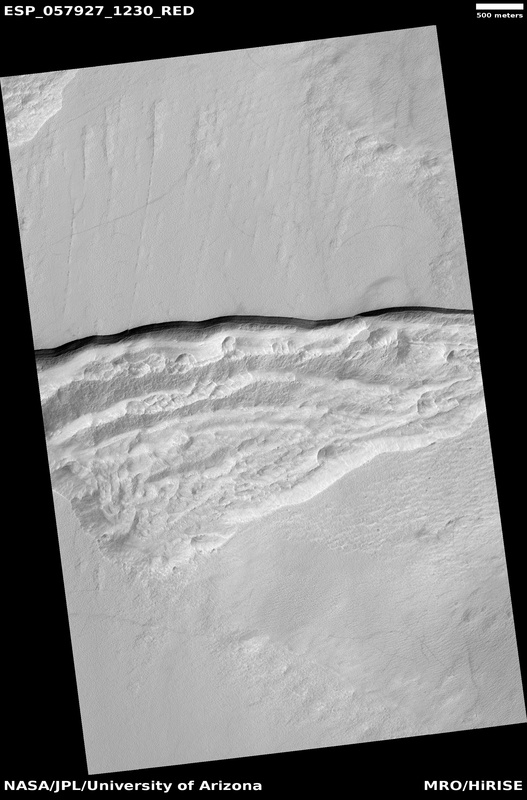 Along the pit’s western rim are parallel cracks suggesting that the plateau itself is slowly shifting downward into the pit. 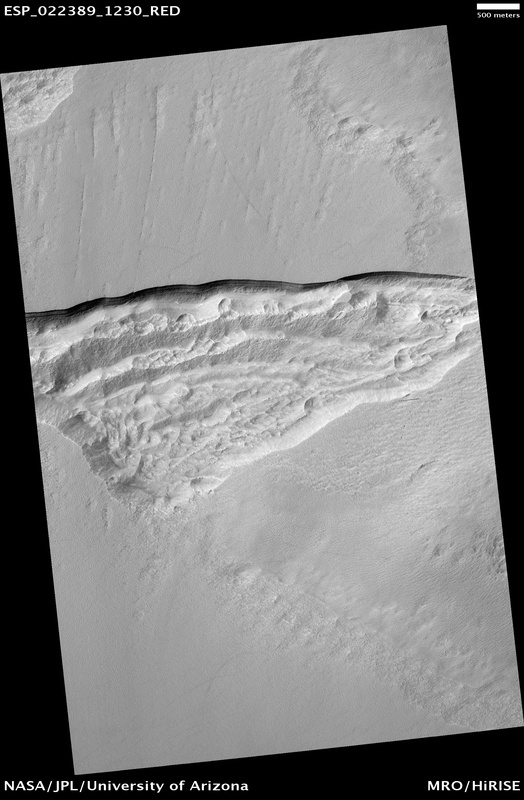 Furthermore, the rim cliff has multiple drainage gullies, all beginning just below the initial top layers. The look of those cliffs is very similar to what sees on the walls of the Grand Canyon, where the top of the cliffs show layers with the bottom of the cliffs buried under a slope of alluvial fill, material that has fallen to slowly form those slopes. 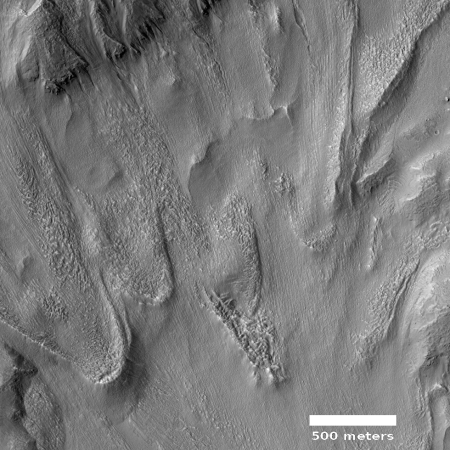 The drainage gullies however would have come later, and suggest that some form of seepage is coming out of the contact between the layers at the top of the slope. 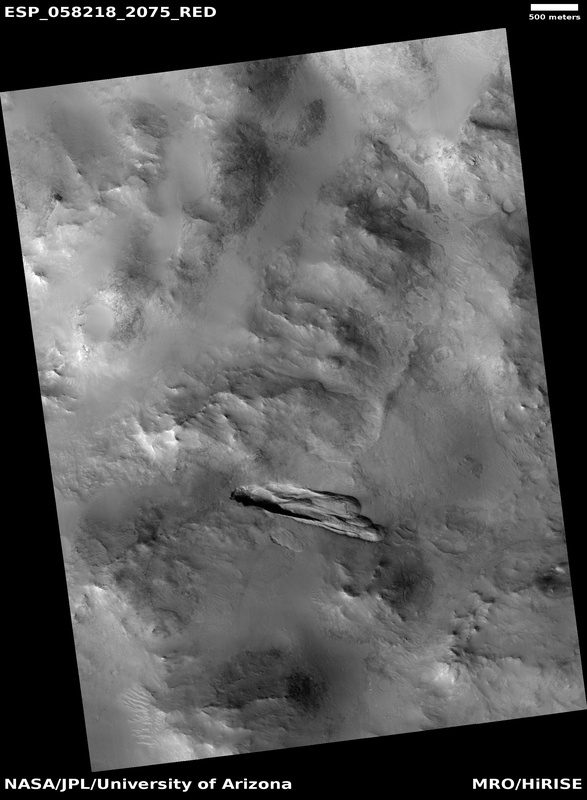 A look at the context image below and to the right reveals the greater mystery of this crater, as well as nearby Maunder Crater, the subject of a recent captioned image release from Mars Odyssey. 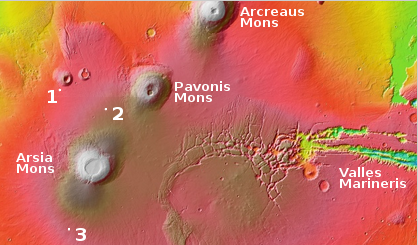 In both cases a circular interior gully separates the crater floor from the crater’s rim. 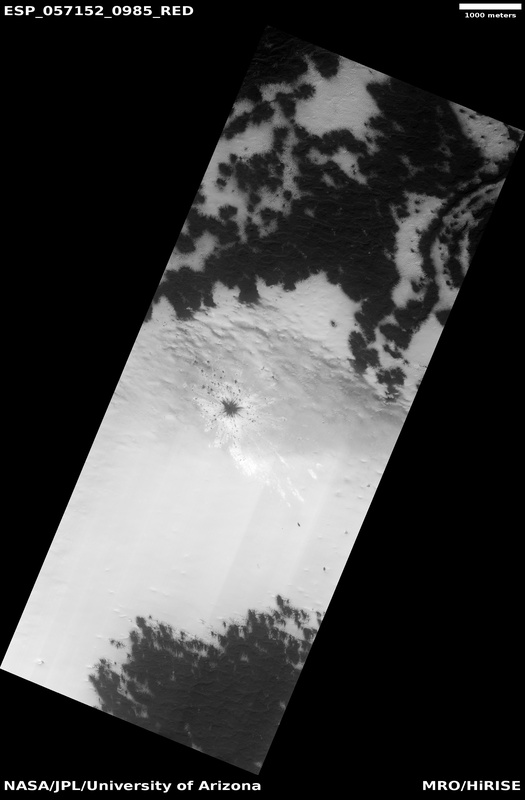 In fact, the crater floor almost appears raised. 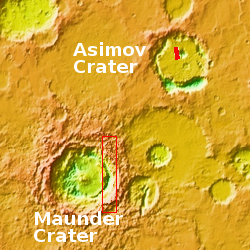 This is especially striking with Asimov Crater, where the central floor appears like a very flat plateau, except for that central pit and the surrounding gully. 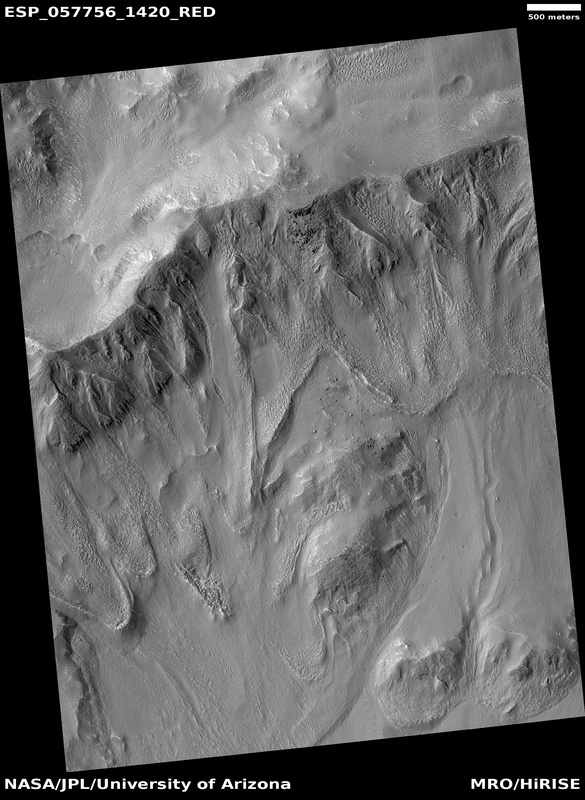 The MRO team has taken a lot of images of the gullies, which you can see if you zoom in to latitude -46.843° longitude 4.831° on the map image at this website. It is clear that they want to know more about the origins of this geology. 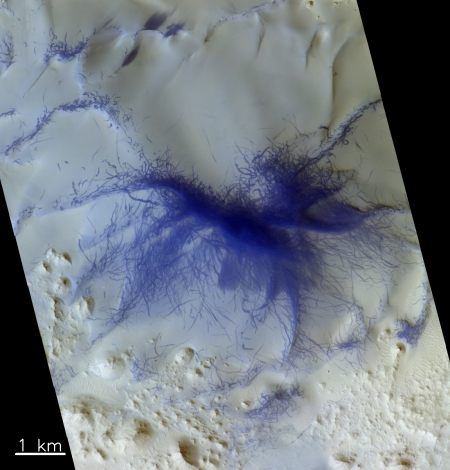 It suggests water flow, even though these craters are located in the Martian southern highlands, a place that is more reminiscent of the Moon, with many ancient craters and far less evidence of significant change. 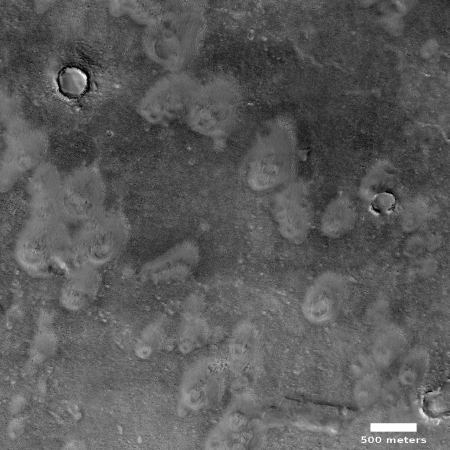 What the geology in these two craters suggest is that some erosion process is eating away at the crater floors, beginning at its edges as well where there are voids below that allow the surface to sink. 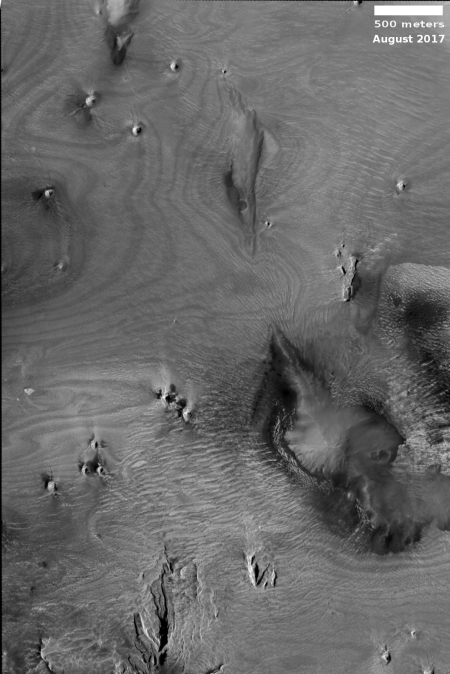 While that erosion is certainly helped by wind, it also implies the presence of underground water, either as ice or liquid, in the past and even possibly today. Cool image time! 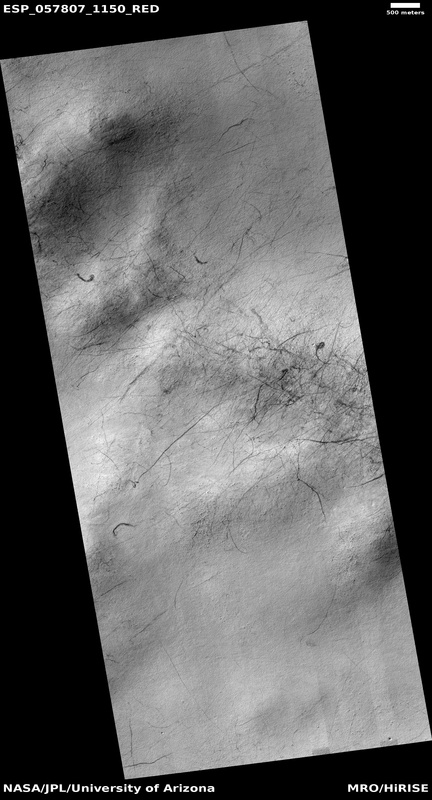 The image on the right, reduced and cropped to post here, comes from the December image release from the high resolution camera of Mars Reconnaissance Orbiter (MRO). (If you click on the image you can see the full resolution uncropped photograph.) 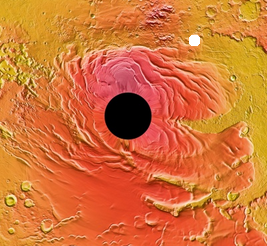 Released without a caption, the release itself is intriguingly entitled, “Crater with Preferential Ejecta Distribution on Possible Glacial Unit. 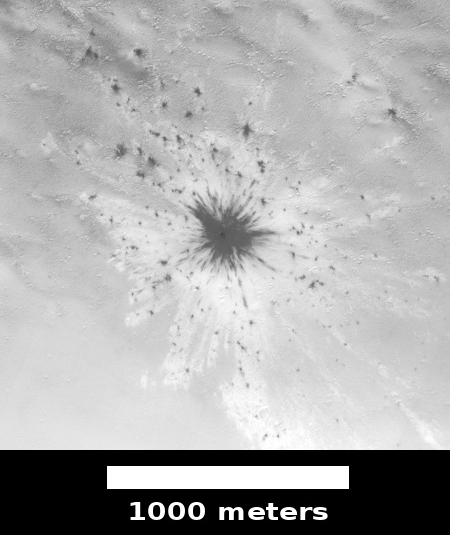 The uneven distribution of ejecta material around the crater is obvious. For some reason, the ground was preferentially disturbed to the north by the impact. 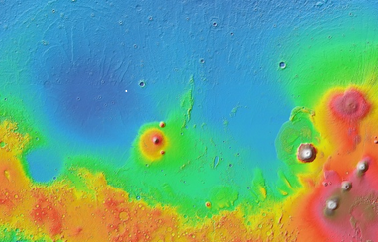 Moreover, the entire crater and its surrounding terrain look like the impact occurred in a place that was saturated somewhat with liquid, making the ground soft like mud. 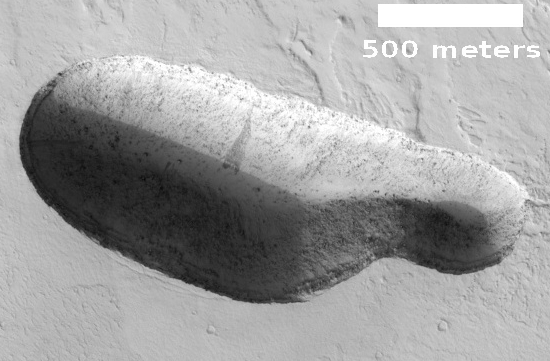 That there might have been liquid or damp material here when this impact occurred is reinforced by the fact that this crater is located in the middle of Amazonis Planitia, one of the larger regions of Mars’ vast northern lowland plains, where there is evidence of the past existence of an intermittent ocean. 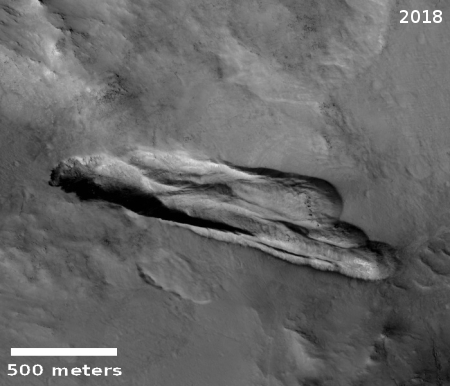 This however really does not answer the question of why most of the impact’s ejecta fell to the north of the crater. From the release title is appears the planetary geologists think that this uneven distribution occurred because the impact occurred on a glacier. As the ground has a lighter appearance just to the south of the crater, I suspect their reasoning is that this light ground was hard bedrock while the darker material to the north was that glacial unit where the ground was more easily disturbed. 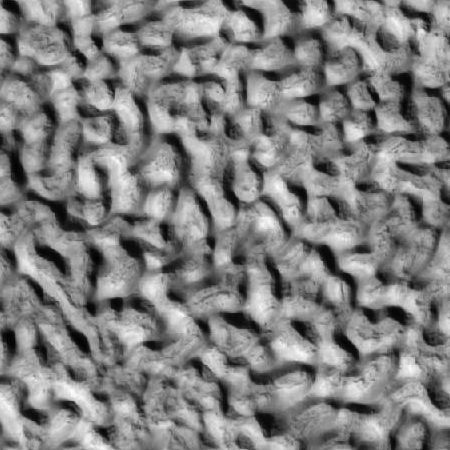 This is a guess however (a common requirement by anyone trying to explain the strange features so often found on the Martian surface). Other theories are welcome of course, and could easily be correct as well. 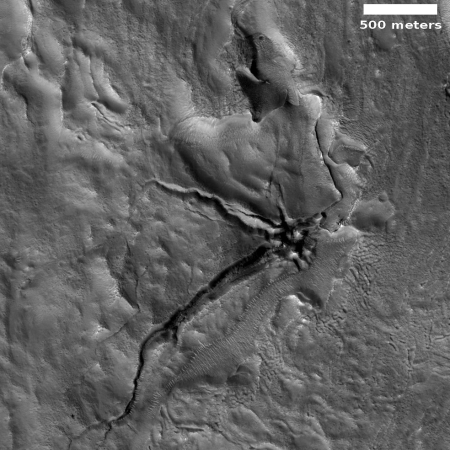 Flowing cracked mud on Mars? Cool image time! 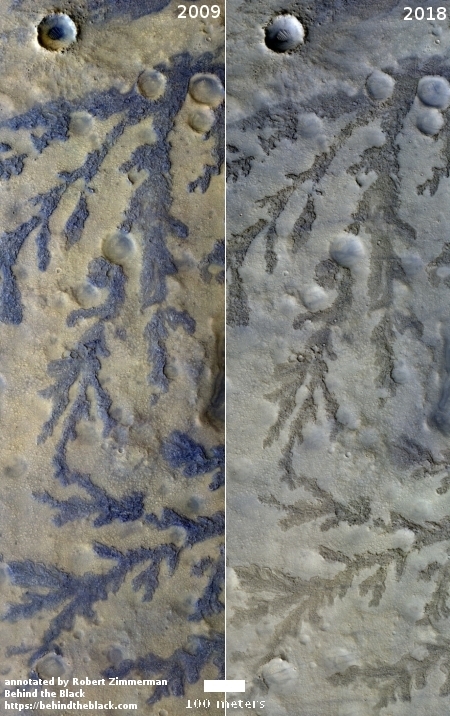 The image on the right, rotated, cropped, and reduced to post here, comes from the December image release of the high resolution camera of Mars Reconnaissance Orbiter (MRO. Uncaptioned, the release titles this image “Cracks in Crater Deposit in Acheron Fossae.” If you click on the image you can see the entire photograph at full resolution. 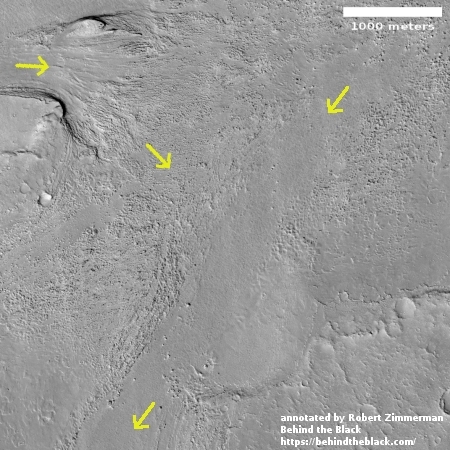 Clearly the cracks appear to be caused by a downward slumping to the north, almost like a glacier made of mud. 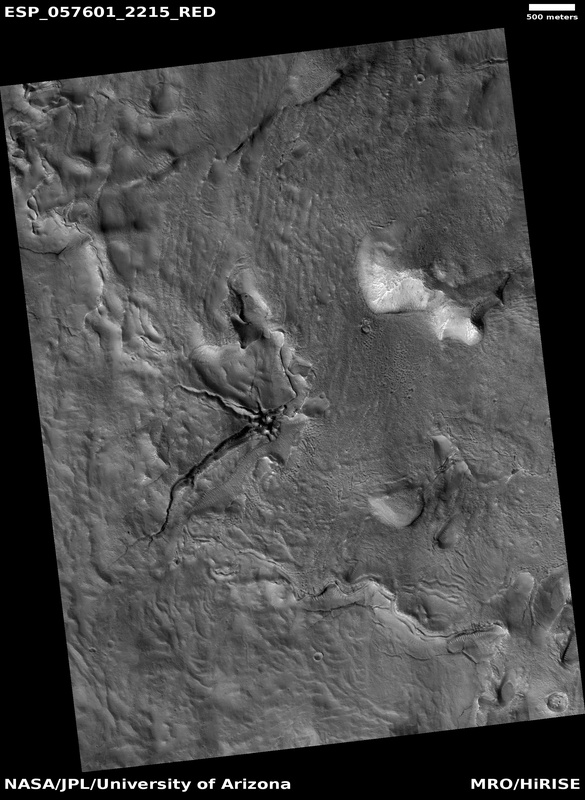 We can also see places on the image’s right edge where the mud appears to have flowed off a north-south trending ridge, then flowed downhill to the north. 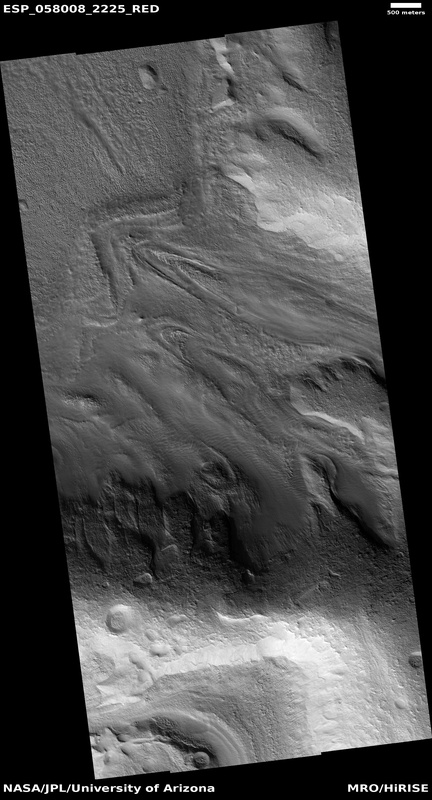 All of this flow is away from the crater’s central peak, which is only partly seen in the photograph near the bottom. 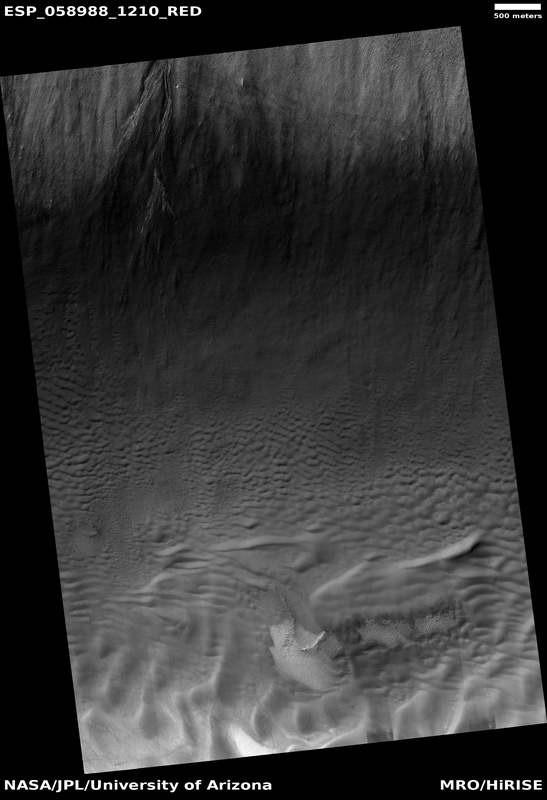 That section is the central peak’s southwestern end, with the whole peak a ridge curving to the northeast beyond the edge of the image. At the north edge of this mud flow the cracks become wider canyons, as if long term erosion is slowing washing the mud away. The flow then stair steps downward in a series of parallel benches. 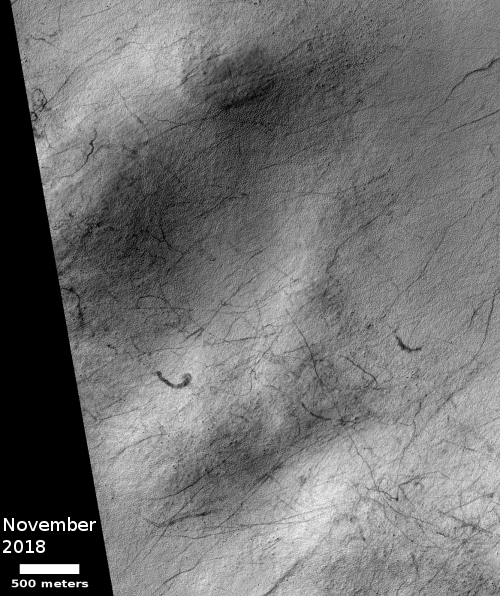 Meanwhile, in the flat central area of the mud flow above can be seen oblong depressions suggesting sinks that also flow to the north. 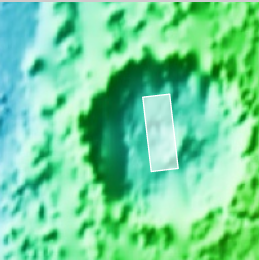 You can get a better idea of the crater’s overall floor and central peak by the low resolution context image to the right. 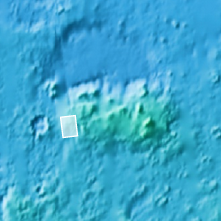 The white rectangular box indicates the area covered by the full image above. 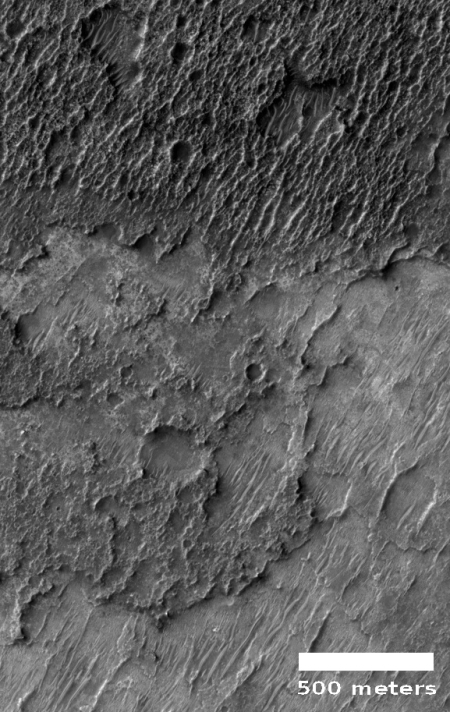 A close look at this part of the crater floor suggests to me a circular feature like a faint eroded smaller crater that includes as its eastern rim the larger crater’s central peak. 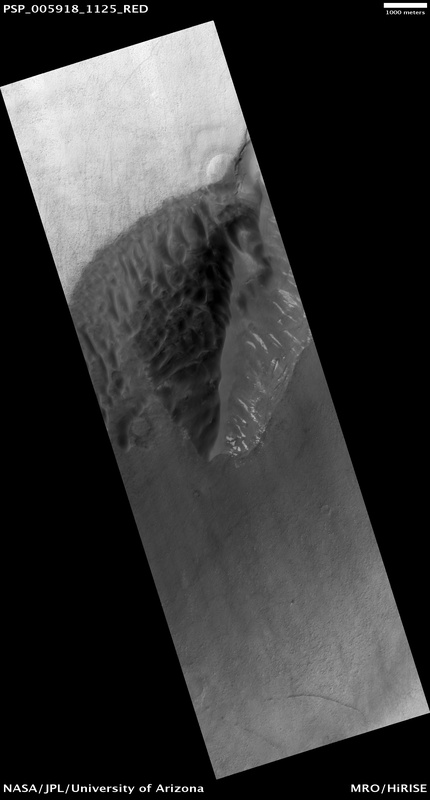 This impression suggests that the flows seen in the full resolution image are heading downhill into the lowest point of this smaller crater, that upon impact had reshaped the larger crater’s floor. This impression however is far from conclusive. 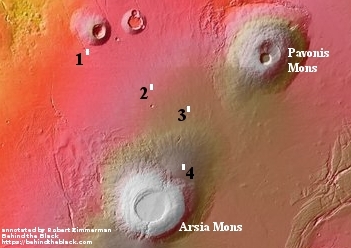 The features in the large crater could simply be the random geology that often occurs in the floors of impact craters. 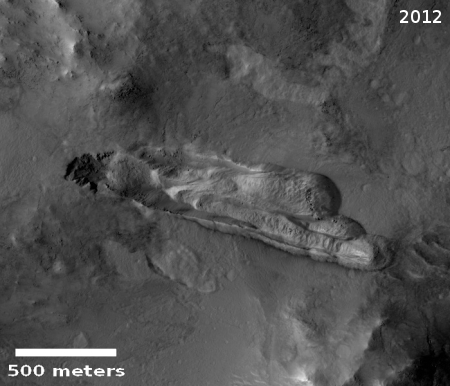 What makes this particular mud slide most interesting, as is usually the case for most Martian terrain, is its location.